Have you ever wondered, "What products or chemicals do pest control companies use? Where can I buy my own cheap pest control spray? 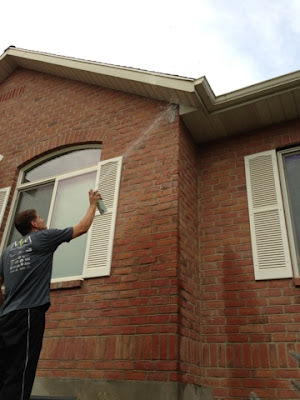 How can I save money spraying my own house?" I came upon the answer when I wasn't even looking for it. It came in the form of a young pest control sales man knocking on my door one hot summer day. He almost had me sold, because I hate spiders and bugs so much, but I'm super tight with money and I wasn't about to sign a year long contract with this guy. That of course was in the back of my mind while I talked to this young fellow. I was coming up with excuses for why I couldn't sign this contract with him when out from my mouth popped a statement that would lead this young man to reveal his companies secret. Me being super genuine- "I have three little kids. I just can't have you come into my home and spray chemicals all around while I sit back and watch, clueless to what those chemicals are, and if they are harmful to my kids..."
Spider sprayer sale guy- "Here let me write down the chemicals for you and where we will use them. You go and look them up on the internet and see if you would be okay with us using these around your kids. I'll come back in an hour and see if we can make a deal." He wrote down three chemicals on a piece of paper with the coordinating areas they were supposed to be used on. I felt like I scored the jackpot when he gave me that green piece of scrap paper. I knew I still wouldn't be spraying the chemicals inside my home because, like I said, I have three little kids who rock my world and I wouldn't want to expose them to harmful things if I can avoid it. But, outside my home, you bet I'm gonna spray it. Here's a list of chemicals and where they are supposed to be used. Fipronil- Inside the home, although it was brought to my attention that this is supposed to be used outside only. Read all labels and read the reviews on Amazon before using. I bought a 1 gallon sprayer because these chemicles are meant to be dilluted. I used about 1 oz of the chemical and a gallon of water. So far I have only sprayed the outside of my home with Cyzmic CS and I have been so pleased with the results. The bugs literally fall dead within minutes of walking across this stuff. I haven't even needed to use a spray inside my home. I have plenty of Cyzmic CS left, so I'm saving big bucks just doing it myself. Like always, follow the directions on the labels and read the reviews. If you're like me and hate bugs, you won't be disappointed with this spray! Another really great place to buy pest control products is DoMyOwnPestControl.com. They have every product you could ever need for pest control plus they have How To videos to teach you the right way to get the job done. Perfect for a busy DIY-er. Overall a good article, but there are a few issues that need to be addressed. My name is Brian, I'm the manager of a store that sells the products you have recommended, as well as other professional pest control products to exterminators as well as homeowners. I'm also a licensed pest control techician (exterminator) in the state of Texas. First, the very first picture you have accompanying this article shows a woman presumably applying pesticide while wearing sandals. The specimen label for all 3 products you recommend require that you apply these products while wearing shoes AND socks. Also, you recommend applying fipronil (Taurus) inside of the home. Taurus has an exterior perimeter label when not being applied as a temite treatment. I mention these in particular because the first line of any pesticide label, whether a can of Raid from the grocery store or Cyonara 9.7, states "it is a violation of federal law to use this product in a manner inconsistent with it's labeling". Also, Cyzmic CS and Cyonara 9.7 are ALMOST the same thing. Both contain 9.7% Lambda-cyhalothrin as the active ingredient. The difference is Cyzmic CS is microencapsulated, so it has a longer residual especially outside where weather can degrade chemicals much more quickly than inside of a home. It also has less odor to it due to it's formulation. 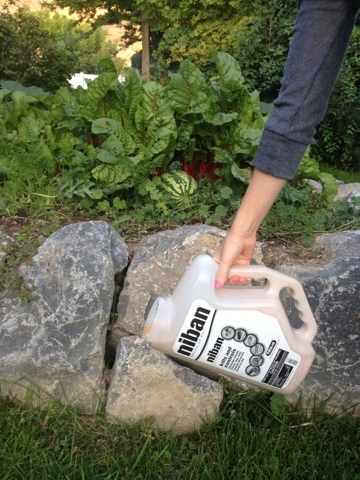 Both are excellent products, and treating your exterior perimeter will prevent most pest problems from ever occurring inside. Thanks Brian for your comment. The picture with the woman spraying the house is actually staged. The house was sprayed previously by me when I was clothed in proper attire. You are right, proper shoes and socks should be worn while applying these products. I will be sure to mention that in the post. Thanks also for the info regarding the fipronil; I will be sure to update that on the post as well. I did already state in this post that everyone should read all labels before applying these products. So, Texas hu? I can't imagine the bugs you have to deal with everyday. Well, actually I can since I lived there when I was young. The fire ants alone are unbearable. Thanks again for your recommendations and have a wonderful day! That's good to know how Cyonara is best used for the lawn and Cyzmic CS is best used for the exterior of the home. This is actually something important for me to know about since my issue is dealing with pests. So far, my wife's been helping me out in finding a pest control service that will be able to provide us with some chemicals.to use against the pests. Megan, that's great that you chose products that will be safe around the children. Both my wife and I are also trying to find some pest control products for our home. Ever since she found several spider webs inside our daughter's closet, she definitely got all worried.